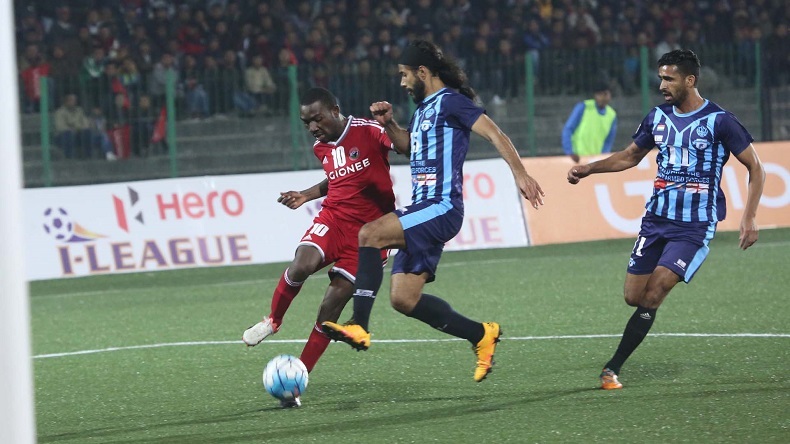 Minerva Punjab FC registered 1-0 win over Shillong Lajong FC in an I-league match. William Opoku Asiedu’s only goal in the game led Punjab to the mark a win shilling. With Asiedu’s goal, Minerva grabbed all three points and placed themselves with 22 points on the top of the point’s table, followed by East Bengal on 18 points. Minerva Punjab FC registered 1-0 win over Shillong Lajong FC in I-league match. Minerva Punjab FC increased their lead at the top of the points table with a 1-0 win over Shillong Lajong FC in an I-League football match on Sunday. William Opoku Asiedu scored the only goal of the game in the 58th minute to help Minerva log all three points. Minerva are now on 22 points from nine matches, four ahead of second-placed East Bengal. Shillong remains on the fourth spot with 14 points from 10 games, one point ahead of fifth-placed Mohun Bagan who have a game in hand. It was an intense, fast-paced game which managed to keep the 5,800 people in attendance at the edge of their seats. Both teams started off on an offensive note with Minerva taking a more aggressive approach. Lajong however, were holding their own against their opponents resulting in an equally matched game. Minerva’s first attempt on goal came in the fifth minute with Opoku getting past the Lajong’s defence. However, his shot was wide of the target. Lajong had a good chance in the 21st minute when Alen Deory’s deflected shot was saved by Minerva goalkeeper Rakshit Dagar. Minerva created another scoring chance in the 40th minute but Opoku fired wide yet again. Lajong replied with an attempt at the Minerva goal which was saved by Dagar in the 43rd minute. The start of the second half saw Minerva applying the pressure. The Punjab based team’s offence was up by a notch as they forced Lajong on to the defensive. The game changer came in the 57th minute as Minerva took the lead from Opoku’s strike. Chencho ran down the left flank, beating NovinGurung by sheer pace and fed Opoku with an assist who in turn sent a magnificent shot into the back of the net. Leading the game by 1-0, the Minerva players were visibly high on confidence as they momentarily silenced the otherwise strong home crowd. Lajong’s chance to score an equaliser came in the 62nd minute but Dagar managed to keep out Abdoulaye Koffi’s attempt. Minerva replied in the 66th minute with another goal attempt by Girik. The hosts wasted another chance in the 80th minute when Lalmuanpuia sent the ball straight into the arms of Dagar. Lajong went on to wasted another couple of scoring chances and could not not make use of six minutes of added time as Minerva garnered three valuable points on their trip to the north-eastern part of India.